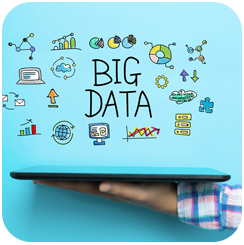 Big data is changing the way businesses operate. With the volumes of information available from a variety of traditional and digital sources, enterprises have the opportunity to dig deeper into data to gain insights about operations, client interactions, risks, security threats and even new business opportunities. But, as the magnitude of business data continues to explode, many companies don’t have the architecture, processes or internal resources to create an environment that leverages value from Big Data. Traditional software packages and manual methodologies are not robust enough to capture and manipulate data. And many IT departments are too overburdened or simply don’t have the right tools to efficiently manage and manipulate the ever-growing amount of structured and unstructured data. With the right resources and methodologies, you can harness the power of Big Data for forecasting and modeling, identifying new business opportunities, improving sales and gaining a competitive advantage in their industry.